Towards the end of 1980, His Majesty’s Starship Derbyshire, the pride of the British Space Agency fleet, blasted off into Outer Space on a mission of imperial urgency. The Derbyshire was crewed by six of Britain’s finest astronauts, hastily trained to prepare for a task of extraordinary circumstance. Jodrell Bank had detected an alien spacecraft briefly entering the inner solar system before retreating to an orbit around 90377 Sedna, the distant red dwarf planet that theoretically belongs to humanity. This attack on British soverign space could not be tolerated by the ruling Earth empire of the day, and so the Derbyshire mission was devised. The HMS Derbyshire launched covertly on the 23rd November, 1980. All seemed well until it passed Saturn, when all radio communication was lost. Its crew were never heard from again. This is their story. 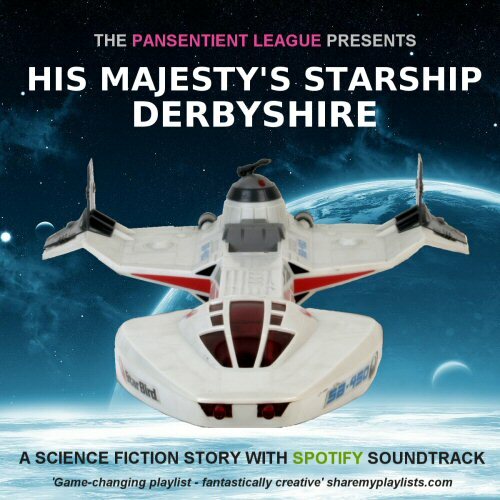 His Majesty’s Starship Derbyshire is a science-fiction story where each scene is accompanied by an electronic music track provided by Spotify. To enjoy the story fully, read the excerpts below while listening to the appropriate song on the soundtrack. 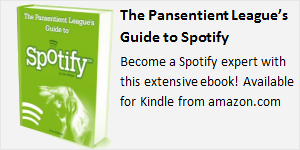 You can click on each individual song title or listen to the whole playlist. The HMS Derbyshire launches from Cape Churchill, taking with it man’s best hope to counter the alien threat and assert British rights to the Solar System. Commander Beatson heads up the expedition. Although in his early 60s, he’s a veteran of the Lunar-Mars run and Asteroid Belt Wars and was always first choice to command the Derbyshire. He is fully confident of total mission success. Or at least that’s what he tells the crew. The Derbyshire achieves Earth orbit and maneouvres to dock with the Disco Lunar Module, where they will pick up the last member of the crew. Navigator Jones checks her Tpad and plots the rendezvous trajectory. She has the autodock option but is keen to show her competence to the Commander and especially to Engineer McPherson, with whom she developed a crush during training. McPherson is oblivious to her affections. The ship’s prototype computer is brought online in stages. One by one, Systems Administrator Usman carefully inserts the protocol rods to raise the analytical machine to near-Turing sentience. He runs various question-and-answer tests on the artifical intelligence (which calls itself Dagda) to verify its self-awareness and morality adherence. Usman does not discover the override commands from London Central. Usman informs the crew that the Dagda computer is now fully operational. Commander Beatson greets the AI and asks it for its opinion on the mission. Dagda reels off various probability factors before declaring that it wants to go home. Usman reboots the machine into a lower Turing rate and wryly asks whether anyone brought a screwdriver. Undocking from the supply module (which brought Astrobiologist O’Quinn aboard to complete the crew complement), the Derbyshire leaves Earth orbit and sets on its way to the staging point at Titan. Not much is said between the crew as they watch Earth recede into the distance. Newcomer O’Quinn is the exception: her excitement at the possibility of meeting sentient aliens soon becomes infectious, and even Beatson begins to loosen up once Earth is out of sight. The HMS Derbyshire speeds on its way. The ship passes Mars and approaches the asteroid belt. A sense of gloom soon returns, as this was the scene of a recent devastating resource war between Britain and Brazilia. The war lasted throughout the 1970s and most of the crew lost someone dear to them during that terrible decade. The AI Dagda announces the name of each asteroid mining facility as they fly by, but thankfully it does not recount the number of fatalities or ships lost. Navigator Jones adjusts the Derbyshire‘s trajectory to avoid Ceres, the dwarf planet where she lost her husband in a disastrous attack on its entrenched Brazilian base. Beatson notices the course change but says nothing. As they leave the asteroid belt, Jupiter comes into view and a message is received from Europa, the Jovian moon where extra-terrestrial life was first discovered exactly twenty years ago. The Europan bacteria were the sensation of the day, as they proved once and for all that life was not so uncommon and clearly not unique to Earth. O’Quinn chats with the Irish scientific team on Europa. They discuss the latest academic gossip and swap bacterium stories. McPherson shakes his head and unclips his flight straps. He heads to the gym and is soon joined there by Navigator Jones. McPherson and Jones are both aerobicising in the gym as the ship speeds towards Saturn. They playfully compete at a game of space tennis, until McPherson concedes defeat and heads for the turboshower. Jones lingers for a little while before following him. She wonders whether she should have let McPherson win. Back in the crew module, Usman is busy tweaking Dagda’s programs under the watchful eye of the Commander. The next day passes without incident. As the ship enter its night-time cycle, Commander Beatson brings out a bottle of single malt and pours everyone a dram. With encouragement from McPherson, the commander begins to recount stories of his Martian exploits. Usually reticent on his extra-terrestrial politics, Beatson recalls his pride in supporting the Martian cause against the lunar colony, who’d lain claim to Mars back in 1968. The crew are in good spirits. Dagda reminds them that getting drunk on duty is frowned upon by London Central. McPherson tells it that he’s in command and returns to his exaggerated stories of Martian heroics. At precisely 02:42 BST, the HMS Derbyshire suddenly loses all power and descends into darkness. An intense green circular light sweeps through the ship, pausing over each crew member in turn. The crew are paralysed and cannot move. The light disappears into Dagda’s core housing module. The emergency backup systems reboot the ship, bringing with it a rainbow of flashing warning lights on every flight console. Now able to move, the crew leap into action, frantically dealing with each issue and alert until the Derbyshire begins to return to some kind of control. At one point McPherson and Jones both place their hands on the same button. They smile at each other but the moment is broken when Commander Beatson announces that the communications array is damaged. Someone has to go outside and fix it. He looks to McPherson, the ship’s designated space walker. Usman finally manages to reboot the ship’s computer, which had been offline throughout the panic. The AI Dagda runs through its diagnostics then declares that it has “seen the light.” Beatson asks it to explain itself, but the AI offhandendly tells him that he wouldn’t understand. Usman shrugs and suggests a complete memory wipe. O’Quinn interjects that it may be worthwhile quizzing the machine first, as she suspects that it may have been subverted by the alien entity. Engineer McPherson heads for the airlock and starts to put on his space suit. Jones follows him to help, fussing over the man and triple-checking every seal and connection in the suit. McPherson locks his helmet down and gives Jones a wink before closing the visor. She shyly kisses the visor and tells McPherson to be careful. He salutes her then steps into the airlock. Outside the Derbyshire, McPherson uses his jet pack to slowly maneuovre towards the communications array. Checking the Derbyshire‘s hull for damage, he pauses to look out at the stars. The ice giant Uranus hangs above him. Finally arriving at where the comms array should be, McPherson’s eyes widen in surprise: the array is not merely damaged but completely missing. O’Quinn is busy interrogating the AI Dagda. There seems to be something seriously wrong with the machine: its usually pleasant and polite personality matrix appears to have been mixed in with something altogether darker. This split-personality worries O’Quinn deeply. The AI’s occasional fits of manic laughter shock the astrobiologist. She’s never seen an AI behave this way before and her suspicion that it’s been compromised by an extra-terrestrial increases. She wonders what sort of alien breed Dagda has become. McPherson sets his suit’s maneuvering thrusters to maximum, racing to reach the airlock before the deadly particles hit. One could easily punch a hole right through his suit, killing him instantly. He instructs the suit to superimpose a trace of the particles on his helmet display and sees a cluster of them heading straight for him. Remembering the EVA training he’d received back on Earth from his mentor Armakuni, McPherson manages to weave a path through the hurtling fragments of killer dust. He reaches the airlock just in time, overwhelmed with relief to return to the safety of the ship. Unseen by the crew, an enormous black sphere folds into existence close to the Derbyshire. The ship’s proximity sensors are controlled by the AI Dagda and do not activate. The mysterious sphere slowly and silently begins to move in closer. Despite the missing comms array and increasingly psychotic computer, Commander Beatson decides to continue with the mission. The Derbyshire‘s engines fire up again and it sets course once more for the planet Sedna. A renewed but slightly forced optimism pervades the flight deck, helped along by Jones’ relief at the safe return of McPherson. The engineer jokes about his near-death experience then speculates about what had happened to the array. O’Quinn suggests that “the aliens took it” but Dagda reminds her that it wouldn’t be the first time something had just fallen off a British spaceship. Outside, the black sphere moves to match the Derbyshire’s course and speed. Commander Beatson instructs Usman to continue working on the AI problems, as he and the rest of the crew make their way to the observation dome. They’ve reached Pluto, the first of the dwarf planets. Rarely seen this close by humans, the crew take a moment to silently observe the planet in all its frozen beauty. The Derbyshire swings around Pluto and heads out from the Solar System. Usman has some good news for the team when they return to the flight deck. Although he hasn’t been able to remove the alien presence from the AI, he’s managed to merge a copy of the original Daga memory into the existing one, boosting the initial instruction set but giving the machine a triple personality as a result. Thankfully Dagda seems almost coherent; it chats with the crew about its initial sentience testing back on Earth and how important the Derbyshire’s mission is to protect the British Empire. Commander Beatson reminds the computer that they must succeed at all costs: nothing must stand in their way, the very survival of the human race could depend on every crew member doing their duty. The ship speeds towards Sedna, which luckily is now closer to the core solar system than it’s been for almost ten thousand years. The final leg of the journey will still take many weeks, so the crew prepare to enter their hibernation rooms. O’Quinn offers to stay awake to watch over Dagda, but the Commander orders her to sleep. McPherson and Jones share the same room. With the crew in hibernation, the AI Dagda spends its days optimising the ship’s engines for maximum thrust and efficiency. Every few days or so the third personality surfaces to take control for a while. It instructs the ship’s robofactory to manufacture a strange object. The other two Dagdas turn a blind eye and do not interfere. Commander Beatson dreams of Mars. Systems Administrator Usman dreams of the cat he left behind on Earth. Astrobiologist O’Quinn dreams of silver butterflies who talk to her about her father. Navigator Jones dreams of Engineer McPherson. Engineer McPherson dreams of a fine summer’s day with Julia Smith, the first girl he ever kissed. Carolyn Jones gazes into the eyes of her lover and traces a finger down his stomach. 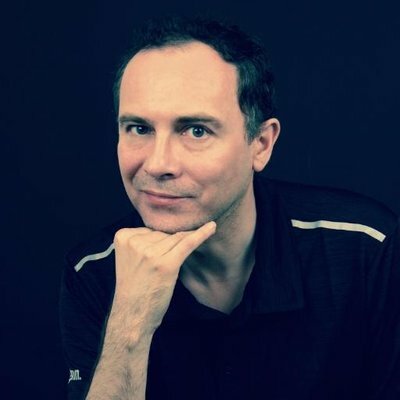 Craig McPherson lifts his head up from the pillow and kisses her softly on the lips. She smiles as her hand reaches down under the covers. This is the sixth day they have awoken from hibernation together to make love. Afterwards, they talk a little about their hopes and dreams and fears that they’ll never see home again. McPherson reaches across Jones to reset the hibernation controls for another week. They cuddle up together as sleep takes them. As her metabolism slows to 25 percent of normal, an egg inside Carolyn is fertilised. It will be her first child. A crack appears in the black sphere, from which an uneartly green glow shines out. The crack widens as the sphere silently evelops the HMS Derbyshire, swallowing it up whole. The crack shrinks back until the light goes out, reforming the sphere again. Shaking off the effects of the hibernation, Commander Beatson hurriedly dresses and heads for the flight deck. Beatson crouches down to take a closer look at the small egg-shaped object standing upright before him. It seems to be made from some kind of black onyx. He gasps when he realises the egg is actually floating about an inch above the floor, despite the Derbyshire’s anti-gravity plates. The egg also appears to be slowly rotating. Jones and McPherson enter the flight deck, holding hands and sharing a large blanket draped around their shoulders. Her voice trails off as she sees the egg. O’Quinn arrives and instantly rushes past the lovers to grab the Commander’s shoulder. “Don’t touch it!” she warns. Distracted by something, Usman walks over to an observation portal. He peers out, then turns to the crew with a puzzled look on his face. Greetings to you too, Commander. We are the Rame. We come in peace. The stars are still there. We have taken your ship into our protection bubble for the duration of the extinction event. We are sorry to say, but as we predicted your home planet and inner star system is about to be sterilised by the gamma ray burst caused by two colliding neutron stars within your Milky Way galaxy. We know because we are The Rame. The Rame are a pan-sentient collective of… concerned citizens. We come from a distant galaxy. We are very sorry for your loss. We would not have come all this way if there were any doubt, Commander. The GRB has now reached the outer solar system. It will be over very soon. Do not have fear: you are safe with the Rame. Those actions were necessary, Systems Administrator Usman. We do not expect you to understand yet. Due to the restrictions of inter-galactic space travel, we were only able to send this one small ship in time to save a fragment of your species. You are the survivors, Commander Beatson. You and the six members of your crew. We hope… we hope that is enough. The GRB has now passed though your inner solar system. We are sorry to say that your homeworld has now been sterilised. We refer to Dagda and the undesignated foetal human. We are quite certain, Commander. We have seen it happen before. The Rame exists to save sentient species from such calamitous events. The GRB has passed. You are now safe to leave. You may return to your homeworld but we fear you will not like what you find. May we offer an alternative? The Derbyshire sits alongside the Rame vessel while the crew discuss what to do. Usman thinks the Rame’s explanation is subterfuge. He believes the aliens are some kind of advance scouting party come to test humanity’s defences before launching a full-scale attack. He advises Commander Beatson to open fire on the Rame ship. Jones is crying inconsolably. McPherson trys to hold her hand but she pushes him away. O’Quinn sits and stares at the black egg, biting her lip and slowly shaking her head. Commander Beatson announces his decision. They will return to Earth to see for themselves whether the Rame were telling the truth. The Dagda AI says that it wants to take up the Rame on their offer and go back with them to their galaxy. Navigator Jones says that she also wants to go with the Rame. McPherson looks at her in disbelief. Beatson reminds her that she’s needed for the return journey but Dagda says that it will leave a segment of itself behind to auto-pilot the ship home. Commander Beatson decides to let Jones and Dagda go. He turns to McPherson and asks him what he wants to do. Jones and McPherson are inside the Rame ship, in an area resembling their hibernation space back on the Derbyshire but with the addition of a hibernation cradle next to the sleeping area. Carolyn Jones is holding the egg which now contains the Dagda AI. She leans down and gently places the egg in the cradle. They embrace each other for a little while until the door chimes. The door opens and the humans finally meet the Rame in person. The Rame take them by the hand and lead them out to see the rest of their ship. The sights they see fill the humans with awe and wonder. They quickly realise that they have made the right decision. The Derbyshire sets course for Earth. It races past Pluto and Neptune, Uranus and Saturn. While the crew hibernate, Dagda navigates the ship across Jupiter space and through the asteroid belt. As they pass Mars, Dagda wakes Beatson, Usman and O’Quinn from their slumber. The crew take their places on the flight deck as Earth comes into view. “Take us down,” says the Commander. The story, all names, characters and incidents protrayed in this production are ficticious. No identification with actual persons, places, starships or aliens is intended or should be inferred. His Majesty’s Starship Derbyshire descends through the sky and lands at Cape Churchill. They will soon find out if anyone is alive or not. Either way, the Derbyshire is home.